The F.I.R.E. Service Club in it's third year at the high school, provides an opportunity for a student to work on a volunteer basis to assist in the community. We agree with Winston Churchill who once said, "You make a living by what you get, you make a life by what you give." Principal Scott Schneider said, "It is our belief that both the student and the community benefit when students volunteer their time and talent." A small group of 5 graduates achieved the requirements of completing and documenting 300 hours of service in the last 4 years. 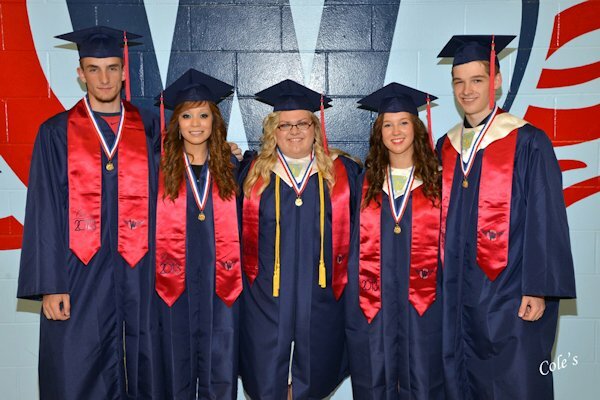 Each was recognized by wearing a gold medallion suspended from a red, white, and blue ribbon around their neck.